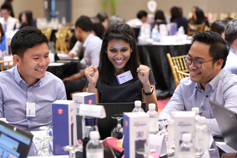 A career with KPMG is more than just a job, it opens doors to a wealth of opportunities. If you're a qualified and experienced professional, and have the talent and ambition we value, KPMG might be your opportunity to make a rewarding career change. With us, you'll leverage our presence as one of the leading professional services firms, enabling clients not only to adapt in a radically changing world, but to flourish in it. Visit our Audit page for more information about the kind of work our Audit teams do. Visit our Tax page to see how our Tax teams are shaping political and business agendas. Visit our Advisory page and explore the complex business issues our teams are addressing. Our internal central services group is vital to the success of the firm. We have opportunities for experienced professionals in finance, human resources, marketing, external communications, collaboration and knowledge, information technology, and risk management. Experience the difference with KPMG. It isn't just about the work you do, it's about making every day count. Explore available career opportunities in our 154 member firms with our global job search tool or go to KPMG country sites.